Since the launch of their first ever home decoration line in 2017, Gucci Decor has gone from strength to strength. Of course, the recent collection is every bit as bright, bold and eccentric as their iconic clothing and has immediately caused a scene in the interiors industry. Comprising cushions, tableware, small items of furniture, dinner trays and even incense sticks; it is fabulously all-encompassing. There’s something for every home-embellishing need. While the cushions and chairs are indeed delightful, I’m most enamoured by Gucci’s wallpaper collection. It’s wild and whimsical and really quite beautiful. The collection currently features nine designs; four remarkably normal (but still quite lovely) floral prints and five much more out-there patterns. It’s these five patterns that intrigue me. They are maximalism personified, featuring designs such as roaring tigers, ornate pineapples and retro-inspired bumble bees. 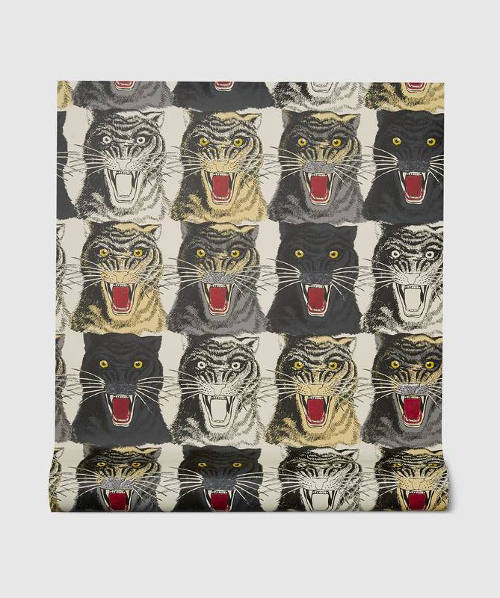 Colour and pattern prevails and there’s the sense that one can never have too much of either; especially in the vintage playing card inspired Tiger Cards design. This may sound a bit chaotic, but the collection is extremely well considered. Several patterns veer close to but fall just short of being ‘too much’ and it works wonderfully. My favourite print by far is the glorious heron print wallpaper. 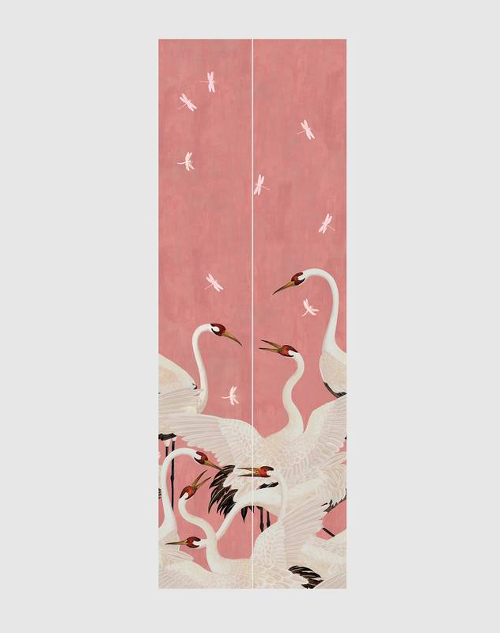 This pattern “depicts the birds against a soft pink ground with dragonflies scattered throughout”. The design is inspired by Gucci’s ready-to-wear collections. 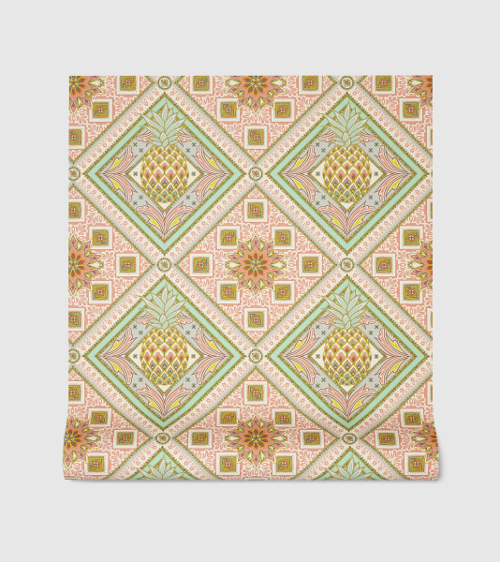 It’s a little more subtle than the others, but no less breathtaking; it would make for a striking accent wall in a grand hallway or drawing room. 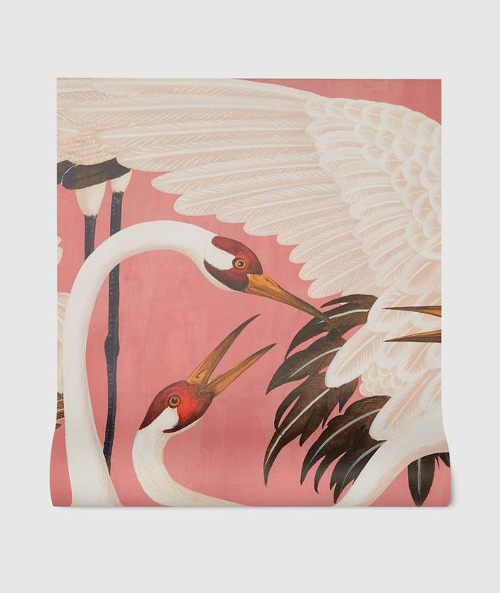 I think this particular design will inspire many other patterns over the coming months, and we may well be seeing herons take over from flamingos as the bird du jour. As is to be expected from Gucci, their wallpaper isn’t cheap. Prices start at £120 for two panels, but you can be sure of high quality, at least. Unfortunately it seems the heron print isn’t available in the UK currently, but hopefully it will land (pun absolutely intended) soon.